Arrrrrr you ready for an exciting pirate themed trick taking card game? Skull King is an impressively illustrated card game where players take turns to try and win each round by having the highest or most powerful card. Special suits and action cards keep this game on its toes. You can even play the original rules or include an expansion set that roughens up the high seas and makes things much more interesting. 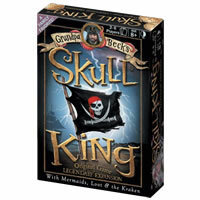 Skull King is a really nicely made game both in the manufacturing of it as well as the gaming experience. Don't let the lengthy rule page scare you. The rules are really quite simple. Change things up at your next game night and pull out Skull King for everyone to enjoy. Don't forget to add this to your gaming collection. Ye be happy ye did. The player with the highest score at the end of the game is declared the winner. Inside the box you'll find 110 cards and the official Skull King game rules and instructions. Please keep in mind that the official Skull King dice-card rules and instructions could be different depending on the game version you have. The rules below are some of the exact directions on how to play Skull King. Share with us your comments, funny stories, tips, advice, strategies, creative ways to play, questions about how to play, problems with the rules or anything you want about Skull King. All submissions will be reviewed within 24 hours. Click here to add your Skull King comments.